The mattress for a child’s bed should be chosen with careful consideration to the child’s weight and age as well as the type of bed on which it will be used. A "first bed" mattress should be comfortable for a small child who will increase in weight, height and strength while being robust enough to withstand the rigours of energetic childhood. A spring mattress should be perfectly suitable for any type of bed whereas a foam mattress must only be used with a slatted base. Whichever type you choose a breathable, waterproof protector is essential for maintaining a clean and hygienic, ante allergy mattress. Older children and teenagers are usually most comfortable in a firm mattress which will adapt to their changing build. Slight framed children may be perfectly suited to a lighter firmness while sporty athletes may prefer an extra firm mattress. A child who has developed a personal preference for the firmness of their mattress is unlikely to be wrong about it. 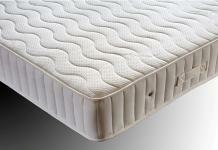 A good quality mattress is an investment at this stage and could be either sprung or foam. A spring mattress should be perfectly suitable for any type of bed whereas a foam mattress must only be used with a slatted base. Whichever type you choose a breathable, waterproof protector is essential for maintaining a clean and hygienic, ante allergy mattress. Guest room mattresses are usually chosen from mid firmness ranges which are neither too hard nor soft; thus tolerable for people of most weights. Sprung mattresses are the safest choice for a temperate coolness. A spring mattress should be perfectly suitable for any type of bed whereas a foam mattress must only be used with a slatted base. Whichever type you choose a breathable, waterproof protector is essential for maintaining a clean and hygienic, ante allergy mattress. Hotel / Bed and Breakfast mattresses must be comfortable, robust and hard wearing. The degree of luxury desired will be dictated by the star rating of the establishment. Hotels’ and hostels’ mattresses are manufactured to BS 7177 Crib 5 Fire Retardant standard rating. Firm rather than soft mattresses are usually favoured but seldom are extra hard mattresses popular with all guests. Spring mattresses are usually preferable to memory foam ones as they can be used with any type of base and offer better ventilation for coolness and comfort. Pocket spring mattresses are perfect for high end establishments offering luxurious hospitality. Whichever type you choose a breathable, waterproof protector is essential for maintaining a clean and hygienic, ante allergy mattress. Caravans and Boats may benefit from non- spring mattresses which are slimmer and may be oddly shaped. It is imperative that a foam mattress is used on a well-ventilated base which has slats or perforations; this will prevent dampness building and fungi forming in an environment which may be susceptible to condensation. Non-sprung mattress may be latex for luxurious comfort, memory foam for pressure relieving comfort or Reflex foam for comfort and value; all of which may be made as soft, medium or hard mattresses. Whichever type you choose a breathable, waterproof protector is essential for maintaining a clean and hygienic, ante allergy mattress. Your own bed’s mattress should be appropriate to your weight, build and preference it should be regarded as a long term investment and thoughtfully chosen. Establish the type of base with which the mattress will be used, this is crucial to the mattress’s performance. A spring mattress may be used with any type of base while a non-spring mattress requires a slatted or otherwise well ventilated base. Pocket spring mattresses offer luxurious support with “no roll together” being a main feature. The number of springs is usually rated by the “count” in a king size mattress. The quality of the springs is dependent on heat treated steel for maximum durability and shaping for peak performance. The combination of upholstery fillings whether - lambs’ wool, cotton, latex, memory foam, flock or polyester etc will define the level of comfort; firmness; luxury and whether it need be turned or not. Traditional interior Bonnel spring mattresses may be favoured for an extra firm support or the value for money which they represent. The gauge of wire used dictates the firmness of the mattress with 13.5g being firm and 12.5g extra firm while the upholstery fillings make the difference in firmness, comfort luxury and whether or not it need be turned. Latex is a superb quality natural product which feels luxurious while offering great comfort and support it can be combined with pocket springs or is equally successful as an un-sprung mattress. Memory foam may be chosen for its pressure relieving properties; it can be used successfully on pocket springs, interior spring or on Reflex foam. 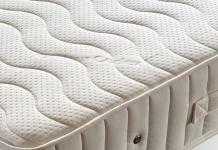 Remember that at Robinsons Beds we offer a range of mattresses in continental and USA sizes. Along with this we will can handmake you a mattress to any size or requirement you have whether it's an extra large mattress or extra small. So, if you have a requirement for a mattress in a size that is not on this site call us on 0141 632 1384 and we will talk you through the options. Whichever type you choose a breathable, waterproof mattress protector is essential for maintaining a clean and hygienic, ante allergy mattress.